Mommies are a sentimental lot. We can’t help getting emotional, hysterical even, when it comes to our kids. I can’t help but feel nostalgic seeing this picture of the first time I ever laid eyes and hands on my son after my C-section. Having this adorable angel beside me made me temporarily forget the pain after my surgery. 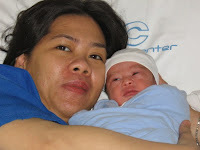 This entry was posted in Mommy Moments, Sentimental Moment. Bookmark the permalink. wow…that is really sentimental! happy mommy moments i have a tag for you =) visit my site =) thnks! truly sentimental! every mom has our own unique experiences in childbirth.